Postmaster General of Belize- Elston R. V. Wade, Jr.
Belize’s Postmaster General, Elston R. V. Wade, Jr., has worked in the public service for the past 32 years. A graduate of St. John’s College, he started as a clerical assistant on February 19, 1979 at the Licensing Authority. He later earned an LLB Level One Certificate from the University of the West Indies. 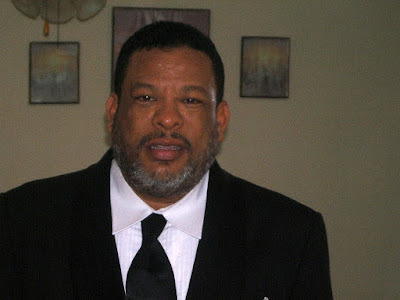 Originally from Bermudian Landing Village, in the Belize District, Wade has a rural upbringing as well as a strong belief in the Catholic faith. In addition to his career in the public service, he has also ventured into real estate, sports and the livestock business. Wade began cycling around the same time he entered the public service. Although an avid rider, he was considered a rookie on the professional scene and for the first time he rode the Cross Country in 1979. He said that his friends still tease him about being the only rider in white shorts – black being the customary color for bikers shorts at the time. His stint in cycling lasted about three years, as he found himself being more interested and involved in track races. He also discovered another interest, and so along with Dickie Bradley, he started to broadcast track and cycle races in the 1980’s. Wade says that the pair of them moved the level of announcing cross-country to higher heights, doing pedal-by-pedal commentary and live interviews with cyclists while they were riding. Meanwhile, his career in the public service continued to progress. In December 1980, he was promoted to the post of licensing officer, which he regards as a natural transition since he had been doing much of the work already – inspecting and licensing vehicles, taking people on driving tests, and playing a leadership role in the Licensing Authority. In 1986, he was promoted to the post of Chief Licensing Officer. He implemented ways in which to promote the bureau and even attempted to convert the authority to a full statutory body to give it more autonomy, but instead, Government decided to make it a department. A determination for a full conversion was later made in 1992, and as a result of that reorganization, Wade was moved over to the Post Office, to fill the post of Assistant Postmaster General. He was promoted to his current title of Postmaster General in 2006. Alongside his professional achievements, Elston Wade, Jr., also made advancements in his leadership role in sports. In the 1980’s, he was involved in a number of sporting organizations. In 1982 and into the 1990’s, he was the secretary of the Belize Cycling Association and he served one term, beginning in 1999, as the Vice President of the Association. He was the Secretary of the Belize Horse Racing Association in the early 1980’s, at which time he was also Secretary of the Belize National Sports Council. From 1996 until September 2011 - except for the year 2000 when he stepped down - he served as the President of the Belize National Cricket Association. One of the most significant accomplishments under his tenure with BNCA, was the Association’s accession to the International Cricket Council in 1997, which allows the association access to funding, training and equipment. In addition to this, he also managed the National Cricket Team, which participated in tournaments hosted by the International Cricket Council (ICC), on numerous occasions. Wade is the son of Elston Wade, Sr., a long time cattle rancher; and his wife Bernice Wade (deceased). He is also the father of three children: Kennard, 28; Jason, 24 and Monique, 22; and proud Grandfather of two: Kenyon and Amyrah. His wife, Pamela, is the mother of his two youngest children. With the exception of his Children, he describes his biggest accomplishment to be his ascension in the public service, from a clerical assistant to the rank of Postmaster General. He began working at the age of 19 and by the time he was 26, he was in charge of a unit of government; an accomplishment worthy of praise and applause. Wade considers himself to be a fierce nationalist who will always defend Belize against those who wish her ill. He is convinced that his career in Public Service is coming to an end and in light of that, has been respectfully enthralled with ideas on how he can better serve his community, following his retirement. He sought political office earlier this year but was unsuccessful. Wade still believes that he can best serve the Belizean people as an elected member of the House of Representatives. From a modest, humble son of a dedicated cowboy, Elston R. V. Wade Jr. has risen to be one of the most impressive, dutiful and memorable Postmaster General in Belize’s history. One of his favorite quotes is:” If everyone is against you, but God is on your side, then the majority is with you”. With so many remarkable achievements attained, it is safe to say that the majority is with him. I'm so proud of him...luv u, Uncle!!! I admire u're consistence and determination,wish u nothing but the best and God blessings,keep up d good work bro, am proud of u! Thanks to all you guys for the nice comments and a big thank you to Mrs. Linda Crawford Elul for featuring me in Village View Post. Good job. It's always good to have knowledge about my fellow villagers and Belizeans. Mr. Wade, you are a fine gentleman. Very proud of you Junie. Hard work brings great rewards. I'm a Belizean living in the USA,and it's really great to see you honor Mr. Elston Wade. He is a great role model, and all the more meaningful because he came from such humble beginnings. My compliments to you Ms. Crawford for this article, it certainly captured one great Belizean. Congratulations brother on your hard work and determination. You deserve this honor because of your dedication in your workplace. You have always been a model citizen and I am happy that your are finally being acknowledged as the Spotlight of the Month. Keep up the good work and continue to reach for the stars. Congratulations Mr Elston Wade keep doing what you doing .good job all blessing on you today and always. Good job Elston I am extremely proud of all your accomplishments. We are all villagers and we show the world how dedicated and commited we are.Congrats Elston!